Peel a few layers away from your brain and you might remember the Noid, Domino’s Pizza’s bunny-eared answer to the Hamburgler. Created in 1986, the nefarious devil did everything in his power to ensure pizzas weren’t delivered piping hot and fresh within 30 minutes. Thankfully, the Noid’s efforts, like Wile E. Coyote before him, were often thwarted. Ah, but that didn’t stop him from getting his own video game, which, curiously, posited the Noid as a hero. 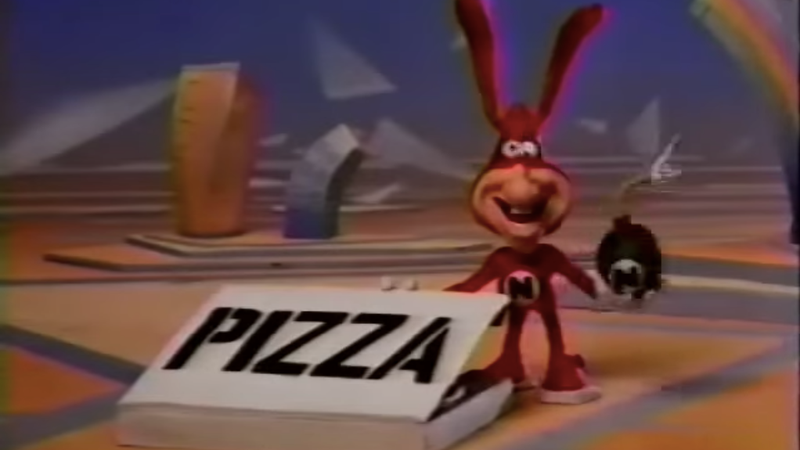 The Noid is no hero in the collective unconscious, however, which will forever associate the character with not only pizza, but also tragedy. In 1989, a mentally ill man named Kenneth Lamar Noid took two employees of an Atlanta Domino’s hostage, alleging that the ads were a personal attack on him. It’s bizarre enough to elicit a chuckle—especially since a) no one got hurt and b) Noid made the employees make him a pizza while he held them hostage—but a new podcast about the situation from Slate’s Studio 360 with Kurt Anderson delves into both Noid’s tragic end, its impact on the campaign, and the questions of culpability faced by the minds behind the character. For its story, Studio 360 talks to Ernie Perich, the creative director behind The Noid; Tim McIntyre, the head of communications at Domino’s; and, most interestingly, Sean Burnsed, who was one of the employees held hostage that day. He recalls his first call to the Domino’s Pizza Safety Hotline, the first gunshot Noid fired, the experience of making him a pizza, and the gamble he took when fleeing through the front door. Map shows which fast food burger chain is closest to any spot in the U.S.